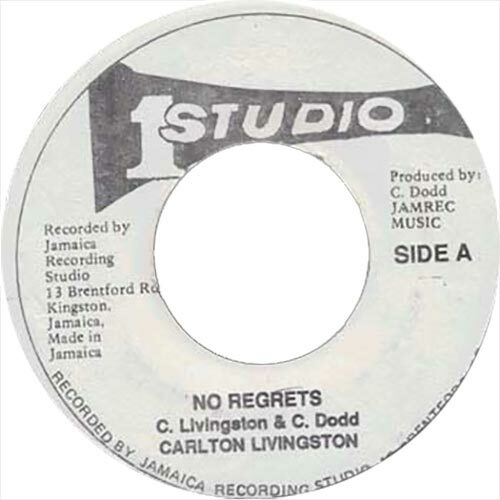 Carlton Livingston is one of the many great singers from Jamaica whose undoubted talents are frequently overlooked. 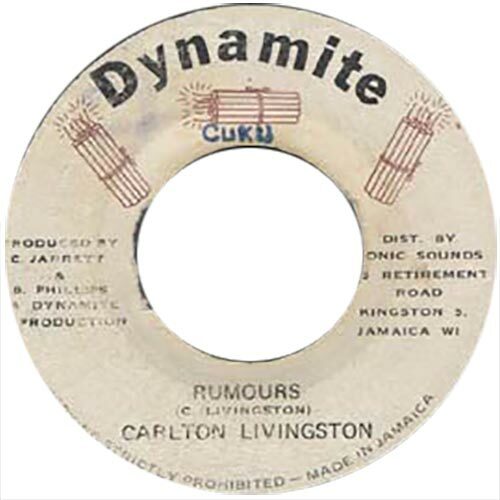 Carlton started with a group of singers in the Trench Town suburb of Kingston (this was a group later known as Knowledge). 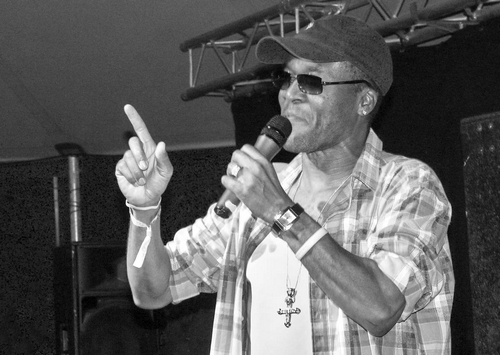 Then turned his vocal skills to deejaying in the early seventies with a sound system alongside well-known micman Lone Ranger before returning to singing again later on in that same decade. 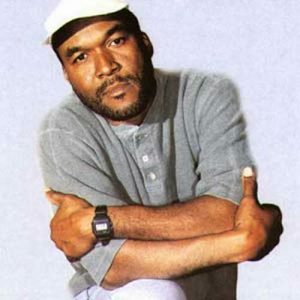 His first release was ‘The Tale of Two Cities’ on Channel One’s Hitbound label in 1977. 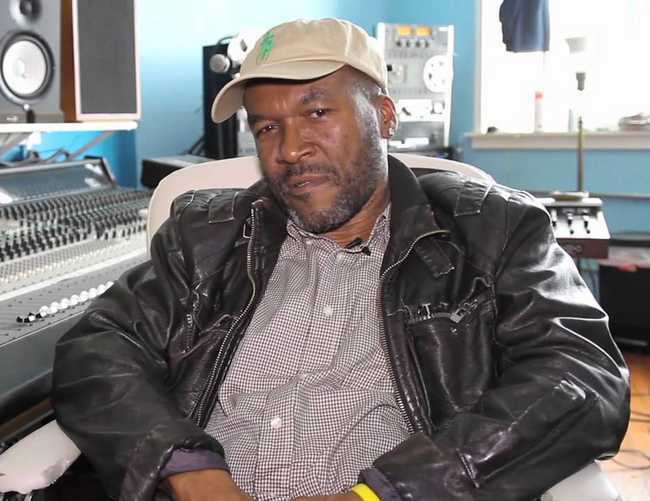 Carlton had several hit tunes for Sly & Robbie, Clive Jarrett’s Dynamite imprint and Jah Life among others. Some twenty years back, around the time of his first albums for the Bebo label he also recorded for Studio One, one single from these sessions, “Why”, was released in 1981. Following this there was another single and he has worked on and off for Coxsone since that time. There is also a Studio One album completed , but unfortunately, still awaiting release. 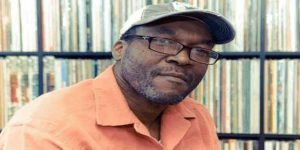 The following interview was conducted with Carlton on the 2nd of February ’03, shortly after he had just finished some recordings for Coxsone and when his Studio One LP was expected to appear at any time. My thanks to Carlton for taking time out to do this (actually calling up! ), Johan, Brian Keyo (Tallawah), Robert Schoenfeld, Tim P and Mike Turner for support and assistance. Give me some of your family background and the music you were surrounded by? I was born in St. Mary, that’s a parish close to St. Ann on the north side of Jamaica. I am the fourth of six children. Musically, my musical background starts from my mother who was a singer in the choir, and my other sisters they just sing in the choir so I’ve got to trace my musical background to my mother’s side of the family. I started singing early, ‘cos I usually go and practice with my mother and my sisters. That’s basically where my foundation came from. So your mother taught you more or less how to do phrasing, the rudiments, or was it someone at the church the family went to? The early influences was the church, because it was mandatory for me to go to church on Sundays (laughs)! And there was no choice, no arguments, there’s no discussion. On Sunday morning you get up, you do what you have to do and by eleven o’clock you have to go to church. After starting out young, after a while the choir appealed to me and I start to stand in the choir at a young age. My mother and sisters, y’know, and that’s basically where it came from. You were never a part of a band in the early days? What time are we speaking now – late sixties? You never entered a competition at the time? No, you know what? Because basically I’m a very shy person. I never usually… To be honest, it’s like even get into music, it was like my friend Doyley (founder of the harmony group Knowledge) had to push me into it, basically. Because, y’know… he used to say “You know, you can sing!”, and I was like: “Yeeeah, sure!” And he say: “No, you can really sing”. Him say that “Really, with your skill you could sing pretty good”. But I wasn’t interested until Doyley came along and he really push me after the group broke up. Before the group reach anywhere and broke up, everyone say them want to sing lead and I decided… I said: ‘if they say I could sing pretty good then basically I don’t need any group – I could go solo’. Well, even after the group broke up, to be honest, I never really say I’m gonna pursuit until I met this guy named Tony Walcott. That time was, like, about 1977 or ’78. Me and Lone Ranger, we were working on a sound system by the name of ‘Fantastic Three’. No, no! You were the deejay and he was the singer then. Right, right! And then it just basically evolved into me being a singer and he the deejay, and they say “the rest is history…”. But you’re right. Yeah. But how come you got into deejaying, first as harmony singer in the Trench Town group, and then a bit of deejay business? Maybe I was just trying to find myself, that’s the only conclusion I can come to (laughs)! Because as I say, in the music, I wasn’t… I didn’t know if to pursuit, I wasn’t interested in it. Because I don’t know the reason why but then I started to deejay and then after I deejayed for a while I started to sing on basically Studio One tracks. The guy I started with – Noel, he said to me: “Carlton, you see the response from the crowd? You should sing!” Then I start to voice one or two tracks and Ranger got back off the singing. Then he start to deejay and eventually he just evolve that deejay is his style – fully. Singin’ full, (would) be my style. And it was while in Soul Express that Tony Walcott discover us. 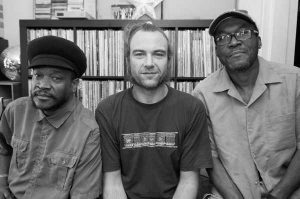 You know, me, Ranger, Puddy (Roots) and Welton Irie we usually go to his house Sunday mornings and do basic rehearsal over Studio One tracks. Learning to harmony, making sure when the bridge come up you’ve got to change your tone and stuff like that, and basically he guide us along. Who was owner for Soul Express? Noel Smith, otherwise known as ‘Skinner’. How long did you stay with him and that sound? You stayed there for quite a while? Yeah, we stayed with him for a while because I was part-owner of the set. OK. This was about ’75, or ’76? ’75/76, yeah. It was Noel Smith, me and another guy name Noel Vassel. That was when we start Fantastic T’ree and then like I said it evolve into Soul Express. But we were all part-owners of that set, up to the last minute when it stopped, which was like ’83/84, something like that. Were these people from the St. Mary area like yourself, or was it a Kingston sound? No, this was a Kingston sound. It was in Franklin Town – that’s Eastern Kingston, near to Rockfort, Dunkirk, that type of area. It was like about a stonethrow away from Dunkirk, a rough neighborhood by the name of Dunkirk. We usually play down there a lot. Basically we were like in those days… ‘Soul’ was the thing – inside. You know, soul bellfoot pants (inaudible) together. But we were never like a soul set, or like a Rasta set. We were like in-between. We straddled both the soul and the Rasta. So we usually have the bigger draw. Because the dreads from House of Dread, which was up in Allman Town… Franklin Town top, duly come listen Soul Express and the guys who usually follow the other set – them who had the soul set – usually come because we play all type a music. But our speciality was like Studio One, rub-a-dub style of music. So basically that’s where it came from. How come you formed this sound? We usually go to school together. We use to go to Vauxhall school, Vauxhall Junior Secondary School. And – it’s the love of music. Actually, basically we started out building amplifiers during about… we start learn about radios and stuff like that from a guy that usually work at… a Jamaican by the name of Earl Toyloy. He taught us how to build amplifiers, and stuff like that. And we start to build amplifiers for people and then we were like “let’s build ourselves a sound”. We scrape some money together and Earl Toyloy gave us parts to build it, and the first amplifier we build was a KD-88, it was like way back in them days. And we start to build something like a 12″-inch, them evolved to 15″-inch. Then we start with 18″-inch, then you know… it really took off, it took off. What about your early, early influences or at least the music closest to your heart in the younger days, before we jump too fast into the recordings. You’ve said that you love the fifties rock’n’roll, the rockabilly, not something you hear too often about in reggae, usually it’s the old style R&B and the soul from Detroit and the south of America. Yeah, because at that time my older sister she would play Fats Domino, and people like that. The Drifters, and my favourite singer, you know, Ben E. King – stuff like that. Sam Cooke is my favourite singer. Sam Cooke is my singer! I love Sam Cooke, I love his gospel set and all them other stuff. I mean, I think, basically, I pattern myself off of Sam Cooke. I love that guy, and when I heard he got shot and killed I think it really shook me. I mean, it just really bothered my part. I felt it, because my sister used to play those records every Saturday morning when she was cleaning the house and stuff like that. So I heard all them guys and I just sing along to them tracks. So basically my influences is Ben E. King and Sam Cooke and stuff like that. Would you say this can be traced in the music, of some of the records that you’ve made so far? Yeah, I would say the early stuff. There is a lot of influence in it until I really found the sound that I’m in. 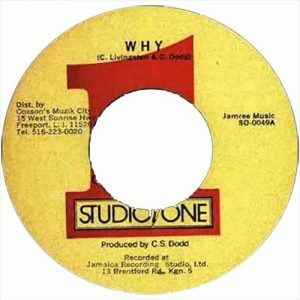 ‘Cos if you go back and listen to ‘Why’, which was the first song I did for Coxsone, you could hear that influence. You know, the sack-up type of stuff. One particular track that, when I do it, I close my eyes and I remember it… and it’s on the ‘Trodding Through the Jungle’ album – ‘Here I Stand’. That’s basically a Sam Cooke song which I… rework it. That’s the way of how much I love that song. In the beginning and for many years you never played an instrument, you worked with tapes a lot what I’ve learned. Do you compose on any instrument these days? Yeah, I was just a straight-up singer. I tried to play the guitar – never got around to it. Keyboards – never got around to it. To this day I have a keyboard. As a matter of fact, I just came from New York and Jah Lloyd (not to be confused with the deejay by the same name) just gave me a Macintosh and I said: “OK, now I’m just gonna sit down myself in the studio and learn to play the keyboard”. ‘Cos I had a keyboard for the last couple of years. My daughter plays it but I never get around to it. Composing without an instrument, isn’t that a bit harder… I don’t know…? No, you know, it’s much more easy. In any form it’s easy to me. I mean, in the beginning it was kind of hard, but after a while it just come natural. Because when I usually write my songs it’s like sometimes… basically other people’s experience. Most of my songs are other people’s experience. Or, am I hearing somebody say a phrase and it just stick in the back of my head and I’ll maybe get a melody, it’s hard to explain. I don’t know where the melody is coming from! And there are times when I write songs before I even know what riddim I’m gonna put it on. Then usually when I’m going to studio and I hear a riddim and I, like: ‘OK, I might make a slight change but this is the riddim that this song is matching’. And it’s uncanny. So moving up to the debut 45 you did, ‘The Tale of Two Cities’. What led up to it, doing that one? That was the first record bearing your name, 1977. Right. 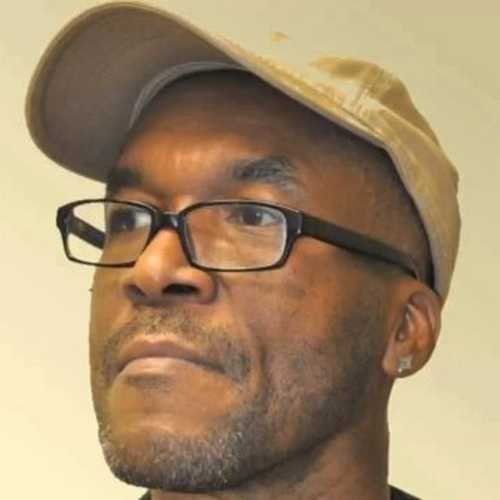 It came from the same name I was telling you about – Tony Walcott. He was a type of person that usually collect like Studio One, Treasure Isle – stuff like that. He was a collector. First person that collects that I knew about. And he would just go around and play songs on certain sounds, walk with, like, a suitcase of songs. He took me and Ranger to Channel One, and I did ‘The Tale of Two Cities’, and I think Ranger did something else. Then after that I think – because Channel One was in the west and they’re more catering for people, like, who lives in West Kingston – like Waterhouse and them places, and we were from the east. It was like it was a long trip to go over there. They, who live in the west, they usually look at you and say: “Eastman cyaan do the same as Westman”. Yeah, you know? A slight prejudice, yeah. Because I can remember one day I went to the studio and Blacka Morwell say to me, “Wha’ yu doing ‘ere?” I say, “Blacka Morwell, why you say ‘what are yu doin’ here’?” I’m gonna sick… And he’d laugh at me. And I always, before he died, I say, “Morwell, remember them days when you say that to me”? And he say, “Yeeeah, but y’know, it was no hard feelings”. So, I did ‘Tale of Two Cities’, and then because of that I kinda ease off a little bit and then we end up doing… he (Walcott) took us up to Coxson. With Coxson now it was much more easier, to work with. So how did you end up getting the deal with Channel One for that very first release, Walcott was instrumental in doing this? It came upon their Hitbound label at the time. Right, right. 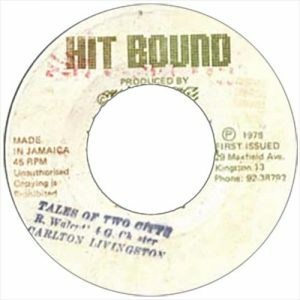 Because one of the little known secrets about that time coming up with Channel One is that most of the riddim track you hear on Channel One they play, Tony was the one who took the records down there and give them the idea for the songs, because he had a lot of Studio One which more people didn’t have, and a lot of Treasure Isle which a lot of people didn’t have. So when Jo Jo (Hookim, main man at Channel One) starts to play tracks, I don’t know where the occasion came with Jo Jo but I know you go down with this cassette… I mean with the records, and he’d play the song for Jo Jo and he’d repeat the riddim tracks. The riddim for ‘Tale…’ sounds familiar, do you know the name of it? I haven’t got a clue. I don’t know to this day – haven’t got a clue. I always ask Tony, and Tony say “Don’t know the riddim”. I just heard the riddim came one morning when I went inside there, and I said to them, “Let me hear it again?” And I listened about three times, and I wrote the lyrics right then and there. Tell me about the inspiration for the lyrics, it’s a heritage thing? Right. It’s basically from… I can’t remember! There’s a book named ‘The Tale of Two Cities’ by George… what’s his name again…? It’s a French guy who wrote this book. It was basically telling you about the colonial influence. It’s like the lyric was like “they came from their far away land, said they’re gonna set us free, but instead they rob and they thief…”. It was telling you about the colonial rule that came to Jamaica with their ideas, but instead of doing what they said they came to do, they’d do other stuff. 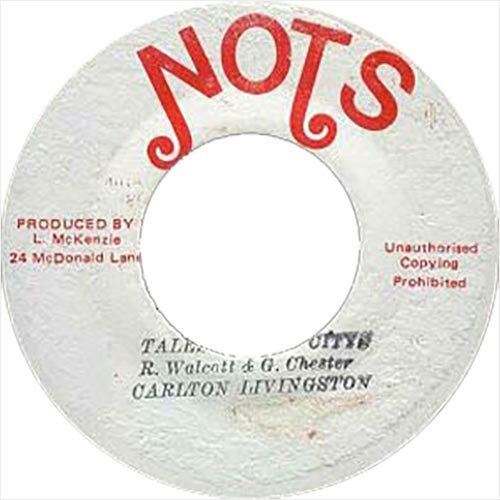 The singles discography Roots Knotty Roots shows that the single came upon the Hitbound label originally, but not the label I have my copy on – which is the ‘NOTS’ label, produced by one ‘L. McKenzie’, at 24 McDonald Lane. You’re aware of this one? Yeah, that’s Channel One. That’s what you call a “bogus label”, but it’s still Channel One. ‘L. McKenzie’ was one of the engineers, I forgot his name…? It wasn’t (Crucial) Bunny, not Solgie – it was another guy, before Solgie and Bunny. He was the one that originally start the engineering at Channel One… Maxie! Maxie, right! So, ‘NOTS’ – is it legit, or a pirate? No, it’s Channel One. But that’s just a label that they used, out of the way. I don’t know how. But I’m familiar with that, that was Maxie. They put Maxie on the producer (credit) for the distributor. I don’t know how but I remember that stuff. The song’s writing credit states that it is by ‘R. Walcott & G. Chester’. Right. That was a mistake. I don’t know where that came from! Because t’was the one who took me (there)… I don’t know if they thought maybe he was the one who wrote it?! And Chester is my friend Leon Synmoie’s brother, he was there with us from the beginning too. So (that’s why) I think his name’s there, but I was the writer. At that time I didn’t know anything about the business of the music, so I think maybe I just let it slide, ‘cos I think I was happy to have my voice on a record too. Are you familiar with the deejay piece to that riddim, ‘Jah Station’ by Johnny Lover? No, I’ve never heard it. I’m surprised that since I record that song, last December was the first I’ve heard it back again in the longest time, in years! Yeah! This guy up in Vermont he put it on a CD and send it to me. And I was just… you know? Long time, long time… yeah (laughs)! So how did that track spin off for your career – what happened to it? Did you record anything else in that same session? You didn’t like the vibe around there? No, the vibe was OK, it was just hard to get your foot into the door with all those people in the west with the talent and stuff like that. And I said we’re from east and in the west it’s just a politics what is going on in the other side of the world. One camp here, another camp there, you better stay away. The next step was recording with Alvin Ranglin? You had another tune on the Orthodox label in ’78 called ‘Living As A Poor’? This was before GG’s? Right. Actually that song I did… was for Thrillseekers. The same guy Chester that had his name on the label as the writer. His brother Leon Synmoie had a label named Thrillseekers, and it was as a matter of fact while at Channel One voicing ‘The Tale of Two Cities’ we met, and he decide he’s gonna do some recordings so he asked for a couple of songs. So he asked what I think, and we end up down there to do maybe about two tracks and then we end up with the album ‘Soweto’. That album came a couple of years after this, didn’t it? Right. But basically it was around the same time we did those tracks. ’78. And it was like we took a day and did, like, about fifteen tracks. Did you voice everything then or did you come back to it later, to update them? You never re-recorded the vocals? No, everything was voiced then in ’78. Right. So this link to GG’s, that must have been in ’77 too. There was this disco 45 you did for him of ‘Trodding Through the Jungle’? GG? GG’s is… you know, the time frame with GG’s is kind of muddy. And the reason why it’s muddy – I’ll explain to you why it’s muddy. Because the experience there was… something between me and GG, and to me I think it was disrespectful. So, it’s like I never really put that in my head to even comment about GG’s stuff, you know what I’m saying? But I know it was maybe about that time because I went up there and did about four songs for him – ‘Trodding Through the Jungle’, ‘Poor Donovan’, and about two more tracks that I can’t remember. Then he put it out on seven-inch and twelve-inch. But then in that same period I was down at Channel One and staying with Taxi Gang, with Sly & Robbie, and I think Solgie was the one who came in and suggested… Solgie was the one who came in and played the GG tracks – with ‘Trodding Through the Jungle’, and Solgie was like, “Robbie, I know if you guys lay this track the right way then it’s a killer track”. So Robbie said, “OK, let’s go”. 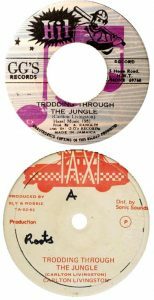 And we lay the tracks the same day and we voice it the same day – ‘Trodding Through the Jungle’ for Sly & Robbie. But GG’s was the first one that came out. So you consider the Taxi version of ‘Trodding Through the Jungle’ the real version of that song? Yeah, the Sly & Robbie version was the version that kick it over the hill, man! Because I can distinctively remember 1980 or… maybe a little before that when politics was hot in Jamaica. I can distinctively remember I was on North Street where there was a big dancehall, and I can remember the night. A sound by the name of Arrows was playing out there and when they played ‘Trodding Through the Jungle’… the eruption of the crowd! I sat back – I was out at the wall, sitting on the wall, and I could not believe it. My head… my whole body just shiver! Then over at Jungle, in Concrete Jungle, they were playing at the Water Tower – you have a water tank over there. And I think U Roy’s Stur-Gav was playing over there, and when Stur-Gav played ‘Trodding Through the Jungle’, everything… people tell me it erupted! So the Sly & Robbie one was the hard-hitting one. That took it over the hill. But GG’s didn’t put this out again, when the version for Sly & Robbie hit? GG’s one was released first. But it wasn’t going anywhere. It was a little bit slower – with Radics, y’know? 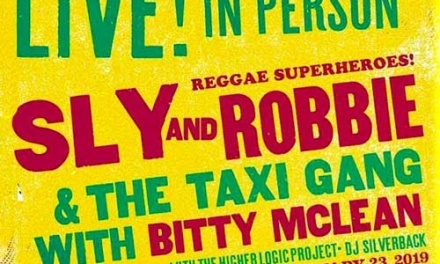 But the one with Sly & Robbie it really kickin’ it in the high gear. We’re still at ’79 now I guess, and your next move after the GG’s and Orthodox stuff, was to U Brown? Right. U Brown is a deejay. You know, as I said while at Channel One U Brown came to me and I was singin’ ‘Please Mr Deejay’ on Studio One riddim track at dances. Which sound was that? Any particular Hi-Fi at that time? Soul Express, still Soul Express… And then U Brown said to me that he heard I had a song on the ‘Rougher Yet’ riddim. And I said yes and he said, “You wanna give it to me?” And I said no problem. ‘Cos then, you know, I didn’t… Then I did (it) for U Brown and it really took off in Jamaica. Then I made an appearance on television – I think it was ‘Where It’s At’, the name of the program, and that was like the first set of entertainment programs in Jamaica, on television. So I came on ‘Where It’s At’ for one time with ‘Please Mr Deejay” And then actually I did two songs for U Brown – ‘Please Mr Deejay’ and ‘Cuss Rasta’. ‘Don’t Cuss Rasta’ – what a tune that is! (Laughs) You know what? A lot of people tell me about that song, it is so funny about that song. I’ve got a friend in Vermont, he has a label by the name of Roots Foundation, I did a couple of songs for him, and he love that song. I always say to him, “I’ve always wondered what U Brown gonna do with that song?” And a guy just emailed me and tell me he love ‘Don’t Cuss Rasta’, and I was like: “OK, here we go again”(laughs)! That fellow could have been me, to me that’s one of your best shots. Did you know that U Brown put it out in France, on a compilation a couple of years back (titled ‘Hit Sounds From Channel One – 1979 – 80’ on the now defunct Tabou1 label)? It wasn’t titled ‘Please Mr Deejay’, he had it as ‘Play This Song For Me’. Right. It has about four different names! It has ‘Please Mr Deejay’, ‘Play This Song For Me’, ‘Mr Deejay’, ‘Have You Ever Heard About My Love’ – Carl Meeks and Daddy Lilly do it over on the Redman label, and they called it ‘Heard About My Love’. About four different titles. Just like ‘Trodding Through the Jungle’ – it has like about three titles: ‘Chalice In Hand’, ‘Troddin” and ‘Trodding Through the Jungle’. The same song, yeah. So, you know, people give it the name to flip whatever they wanna do it, y’know? As a “new” song or whatever. So it was only two songs you did for U Brown, and they were both pressed at the time? No, the only thing he put out on single was ‘Please Mr Deejay’. ‘Cuss Rasta’ just came out the other day on the compilation. 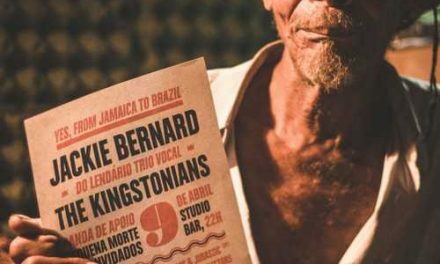 I think he plans to release it on a seven-inch in Jamaica. Titles like ‘Rasta Get the Blame’, ‘Don’t Cuss Rasta’, ‘Call of the Rasta’ – what kind of relationship do you have to the Rastafari movement, from then up to now? At least there’s several lyrics in defence of the Rasta. What was the inspiration for that song, ‘Don’t Cuss Rasta’? ‘Don’t Cuss Rasta’? Before I really get into the business I was a postman, and I have this friend, we usually work together – he was a Rasta. But then he cut his locks, and there was a guy name Barry in the office every day would mouth him, and I say to him, “Why you cuss Rasta?” I mean, he would curse Rasta and then Barry, usually, say, “Why you wear yu locks all the way down to your bottom?” You know, he wear long… he were dread. And I know he cuss Rasta. I sat down and wrote that song one day in front of the office, me and Barry, we were talking about it and I wrote ‘Cuss Rasta’. And, like, ‘Rasta Get the Blame’? It was like in the early eighties when everything bad was happening in America – is Rasta. Everything happen – is Rasta. So I always write my song offa reality. Always write about things I see and I hear. And I guess most of my songs… people can relate to it or see in it or… it does something to them. Somehow the prejudice about Rasta is still very much there in society – even today. Why do you think that is? It will never stop. I dunno what people get provoked about, they just have to ridicule them. Right. No, it will never stop. I think maybe it is that some people they don’t understand the culture, or they don’t want to understand the culture. Maybe it’s because it is out of the mainstream, or maybe it is just imbedded in society to be like that. Maybe that’s just what it is. Your upbringing, you’ve said somewhere that you didn’t grow up in a poor family, which doesn’t necessarily suggest that you had some kind of priviledged family situation – how did it look like? No, I mean… we weren’t really poor. I could say this: I’ve never been to bed hungry, unless I chose to! My mother always make sure there’s something there. You know, we were never really middle class, and we were never poor, we were in-between middle class and poor. But we survived, you know. Why didn’t you continue with U Brown? I mean, after ‘Please Mr Deejay’ hit? What was the circumstances there? An album should have been followed by the success with this tune, don’t you think? Yeah, and not getting enough attention? Yeah, exactly! That’s when we went to… Studio One. And this is like 1980, or something like that? And Ranger had this (Studio One) album ‘On The Other Side of Dub’ out at the time. Was it Ranger that brought you there to Coxson at the time, or Walcott again? That’s one of the stories, how did it come about? But around that time, only one tune came out of this? And then you went to him again a couple of years later for ‘Jam It Up’? Yeah, ‘Jam It Up’. A couple of years later I went to him. That was after I went to Dynamite Records, with Clive Jarrett, and did ‘Rumours’ and stuff like that. Then I went back up to Sir D and did ‘Jam It Up’. In that period Dynamite fell between that… ‘Jam It Up’ and ‘Why’. And in 1980, with the help of Sly & Robbie, my friend Clive Jarrett decide to start a label with Ranger, then we started Dynamite. And then Ranger did an album and I did an album, which spawned hit like ‘Woman’, ‘Here I Stand’, and then Robbie gave him ‘Trodding Through the Jungle’ and put it on a pre, and that took away that album too. If you could estimate, how many tracks did you record for Coxson during that eighties period? For Coxson? In the eighties I did maybe about twenty tracks. After 1980 up to 1999 I did like about fifty tracks. You know – maybe more than fifty tracks, ‘cos there was a time when I just go up to the studio an’ voice, just voice because I didn’t have anything else to do. Yeah! I just intend to go there and voice – voice tracks. But the only disappointment I had with him was that he never released my stuff. And I was kind of disappointed… until finally last year he decided he was gonna release some stuff. It will be out maybe by the end of February to early March (’03, which didn’t happen). I keep my fingers crossed, hopefully! How come he decided to finally do this album now after all these years? I think what happened is that he started to get a lot of response from people calling and asking for tracks that I was doing as special for sound systems. Like ‘Trodding Through the Jungle’ – people keep asking why he didn’t release it on a 45 or something. And one day he said to me – we were talking one day – and we said “These tracks Sir D, I’ve voiced them for something like about ten years now”. And he was like, “Yeah?” I said, “Yeah!”, and I said, “I’m really disappointed that you don’t release my stuff”. I mean, I’m not jealous. I’m not the type of person to digest about anything, but I think I deserve it. I said that: “People come after me and did work for you, and you release their stuff “. I said that: “Maybe because I don’t call you I’m badging you, maybe that’s why you treat me like that?” So he decided seh he’s gonna do something. ‘Cos I don’t really call producers to put out my stuff, I don’t think I need that. I think my work speaks for itself. That’s the way I look at it. Maybe I’m wrong, but that’s the way I look at it. But then after we started to communicate and he said OK. Last month he was up in New York and he called me and I went to listen to some tracks and there were some that never will be released. And t’ing about it, is on the wickedest set o’ rhythms! Is not like common rhythm that everybody plays. I always chose some rhythm which is like a… obscure rhythm. So you got a free hand to choose whatever, what you wanted to voice on? Actually I choose all the tracks I want to sing on. With Coxson I just, like, find a tape and seh to him “this is what I want”. I was interested in how he works, seems like he gives you the free hand to approach it the way you want to, whatever tracks you request, or he has full control? I get the impression you do? Yes I do. Surprisingly I do! I never have a problem working with him. I usually choose the tracks I want. Only problem in choosing the tracks I want with Coxsone is that… it takes him a long time to find them (laughter)! Yeah, because sometimes he’s not aware! He was like, “Carlton, where these tracks from?” I was like “I have collected all these things on cassette”. And I usually write them and I know what I want. Like, for instance – Larry Marshall. I love Larry Marshall! You know, I love his songs (laughs)! And, like, I did a lot of lyrics on Larry Marshall tracks. And he (Coxson) was like, “I can’t remember these tracks!”. Finally, he find them and I voiced them and that’s it. Yeah, he give me a free hand. Surprisingly he has done that to me. And that’s the only free thing he has given. That’s the only thing he gave me – a free hand. Instead of release it (laughs)! So, you know, I’m grateful for that. I chose the riddim that I wanna sing on, ‘cos I always tell him “I don’t wanna sing on everything that everybody sing on”. I don’t believe in that. True. You have to distinguish yourself from the rest? Exactly. So he said, “choose what you want”. How is the man to work with? I mean, all this talk over the years…? Most of it is just talk (laughter)! Yeah! He’s cool. I mean, I can only speak for myself in that sense and Ranger would tell you the same thing too. I mean, we go to Sir D and voice tracks and we sit down listening to it and if we wanna change it and if he hear anything he want… we change it. He’s easy to work with. Him and Jah Life is one a the easiest persons to work with. 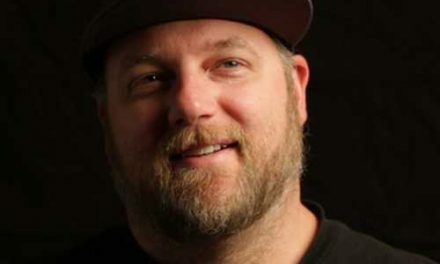 By the way, what happened to Hyman Wright (Papa Life)? I know he had the Grade One label during a part of the nineties, but…? He has been quiet for a while but I think he is ready to get back on the scene. I was just in New York and up in the studio and he has a lot of things. 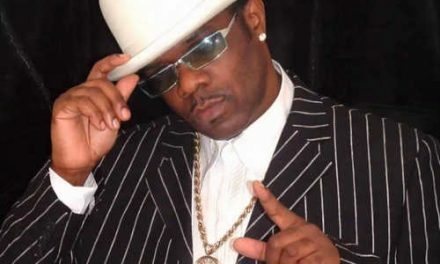 His catalog is huge now – Johnny Osbourne, Sammy Dread, Sister Carol, Scion (Sashay) Success. I mean, he has a big catalog so I think he is ready to… You see, Jah Life’s problem, he’s just trying to find a distributor who he could really (rely on). Jah Life is like Coxson, he don’t really trust anybody. Yeah, you know, if you deal with him – is not about the money, Jah Life’s problem is just if you take his thing and put it out and market it and enrapture (?) he don’t want to do that. So, basically that’s why he haven’t done anything in a while. You more or less disappeared for a while, after a peak in the mid-eighties – what happened around that time, say ’89 to ’92? What happened was I migrated to the United States and it was totally different. You know, with family and stuff like that. But actually at that time I was doing recording but I just didn’t have anything released. At that time I was recording stuff for Coxson up in his studio on Fulton Street. I was recording for Jah Lloyd ‘cos I have, like, about 40 songs in Jah Lloyd’s catalog. I just get up and go voice ‘cos he do some good tracks. I just go an’ voice but I didn’t get anything released. But otherwise than that I was doing a lotta recording. And basically my peak was around ’83 to ’84. But it was just one of dem t’ings. You know, I was just recording anyway. I have a too huge catalog. I went to Jamaica and did songs for Junior Reid, Bobby Digital and Jammys, but Jammys was like he only release that one song off his catalog. Junior Reid hasn’t released any. I’m really pissed at him too! Jammys is the same t’ing. I think he really had a great catalog down there. Only one who really done a little stuff was Digital. I give him his profit, but… You know, I don’t understand the business sometimes, what they do. But I think they could have done better. By the way, I hope someone – yourself or the man responsible for the original (Beswick ‘Bebo’ Phillips) – could reprint those ‘Soweto’ and ‘Rumours’ albums one day? They came upon the Bebo’s label back then. You mean Thrillseekers? Yeah, we plan to bring that back out. Actually I got the tapes a couple of months ago and I gave it to Jah Lloyd to run it through and clean it up. So I have that to put out. We’re thinking of combining it together.